Wonderful card, Susan! I love that button sunshine!! Too cool! And your GDs are ADORABLE!!! I KNOW you’re enjoying them so much! Your card is simply brilliant, Susan! Love the sun you`ve created, and the little label. They are such wonderful details!! Your spotted dog made me sooo smile , great layout and cute with the button… keep enjoying your GDs this age is so, so sweet and passes so fast. Oh what a cute card!!! The sun is so clever! What a sweet card!! LOVE your button sun and stictching!! I love your cute little doggie, and wonderful sun!! Your granddaughters are just darling, Susan!! Those sweet girls are getting so big, Susan. ummm…….cute card but I think it was upstaged by two even cuter sweeties! What a set of cuties!! You should be a proud grandma!! Cute card too. Wonderful card. So, sweet, fun and fresh. Your granddaughters are totally precious! Every single photo in this entry is adorable! Love your puppy card, and you grandaughters are too sweet for words! I don’t know what’s more adorable….the card or your granddaughters. 🙂 Thanks for sharing your photos of them. I know you’re enjoying their visit. Precious granddaughters!!! The puppy care is very cute, too! Wonderful card, Susan! Love the puppy! So cute! And what a brilliant idea with a sun! Your granddaughters are so precious and very beautiful! Susan, thanks so much for leaving such a lovely comment. Please give the Twisted Thursday sketch a try. We would love for you to play with us! This is soooo cute, Susan….the little pup is adorable and I LOVR how you created the sun!!!!! Your little DGD’s are sooo beautiful…such precious little girls!!! 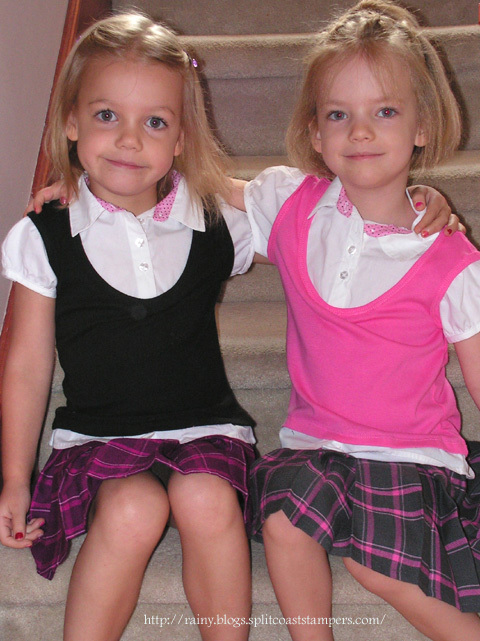 Oh my heck…I just wanna squeeze those girls…they’re precious! Your card is adorable!….but that photo of the girls is STEALING the show on this post. Oh those sweet little faces! 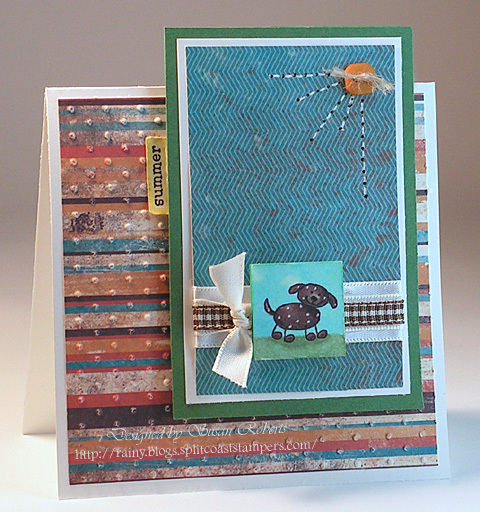 the card is dog-gone cute- love the button sun and thread rays. But those little girls are beyond cute! omg- how sweet! Your card is cute … but nearly as cute as these two little ones!! OMG … they are precious!! You must be SO PROUD!!! I was just telling my son today that it feels like the dog days of summer here. It is hot and humid and the tomatoes are getting ripe. Love this little image and your dp is perfect. Super sun. Your DGD are adorable. Are they twins? My goodness . . .each picture of those girls is just more and more precious!! They really do look just like you!! Hi dear i always like your blog and i have an award for you in my blog..Laura. OMG Susan………….your granddaughters are sooooo cute!!!!! And I’ll Grandma painted their little fingernails too!!!!! PS I am so jealous…I have two little grandsons that I love dearly, but I would love to have a little granddaughter too!!!!!!!!!!!! 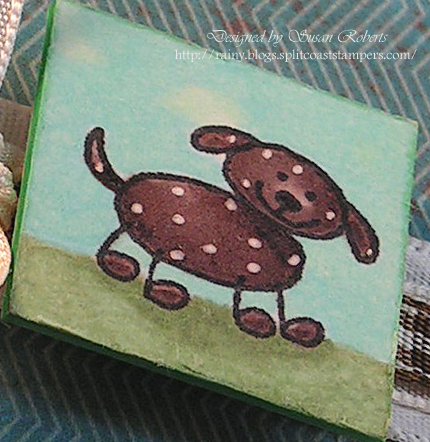 Your card is darling — love the little polka dot puppy. But your granddaughters… wow! They’re adorable!! Picture perfect. What fun they must be for you! Love, Love that button sun! Soooo clever! How SWEET and how BIG they’ve gotten!!! What a lucky grandma!